Drug testing via hair follicle sample has grown into a very popular method to detect drug use without invading ones so-called privacy compared to a urinalysis or a blood test. ZYDOT Ultra Clean Shampoo and Purifier include Aloe Vera to help condition both the hair and scalp at the same time as the penetrating cleansing agents eliminate impurities. The Aloe based conditioner will leave your hair tangle free and full of body. You should use ZYDOT Ultra Clean Shampoo on the day you wish your hair to be clean and free of unwanted impurities. 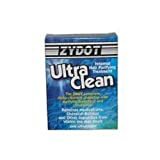 Since 1987, Zydot Unlimited, Inc. has been devoted to research and development of original cleansing products.